Hey there, everyone! Did you have a good weekend? Ours was fun, and pretty busy! It felt like we were constantly on the run somewhere, or I was baking something. I made the coolest rainbow cupcakes for St. Patrick's Day...I loved how they turned out! We dropped off a baby gift to some friends and chatted with them for awhile. Then we hung out with some other friends and ate corned beef & cabbage, drank green beer (or green Muscato for me...not much of a beer drinker), and watched Boondock Saints. Then after church last night we watched The Walking Dead season finale....it was AWESOME! And I cannot believe we have to wait until FALL for more episodes. Today I have my third post as the Flourishes Limelight Designer to share with you! My card is inspired by an image of a decorated room that I found while searching in google images. If you want to see the inpsiration photo, please go to my Inspired by a Room post on the Flourishes blog. The photo is fabulous, and is very close to what I want our room to look like when I am done decorating it! Here is my card! Instructions: Make card from kraft cardstock, then round the bottom corners. Cut blue paper slightly smaller, round the bottom corners, sand the edges and adhere. Punch an upper crest border to striped paper and sand the edges. Cut a brown flower strip, sand the edges, and adhere the punched border to the bottom. Adhere the entire paper block to the card front. Cut a banner edge from striped paper, sand the edges and wrap twine around the middle of it. Adhere to the left side of the card. Cut around the top and two edges of a fabric vintage image, and adhere to the front. Tie a double bow from twine, adhere to the top of the vintage image and add a jewel to the center of it. Cut a banner edge to a striped paper strip, and sand the edges. Stamp the sentiment to it, then adhere tot he right side of the card. Thread a button with twine and adhere to the left side of the sentiment strip to finish. There you have it, my cute little baby card inspired by a room! I just love that cute vintage image, and have been wanting to find some inspiration to use it! Now I finally have...and I love that! I have had it in my stash forever! Gorgeous card! My son and I watch the Walking Dead too since the begining. We so can't wait for Fall either. What a great show. It has you on the edge of your chair at times. The girl in the cloak was awesome. Gorgeous card, I love the colours and the image is wonderful. what a beautiful baby card! I love it! How sweet, thanks for playing along with us at CCCB! 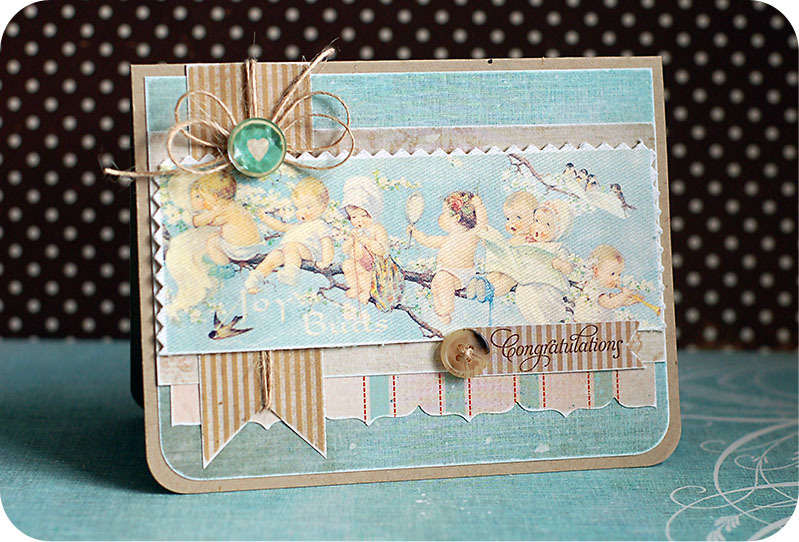 Gorgeous card for our challenge this week at Sugar Creek Hollow, love the vintage image and your color palette. We hope you can play again soon. What a sweet card.. Thanks so much for playing along with us over at CCCB! Beautiful card Lea, thanks for joining us at DYSU this week! Oh this is so cute Lea! Love that vintage image. So glad you could play along with us on Card Patterns this week! Absolutely gorgeous card. I love the fabric image and all your fabulous layers. Thanks for joining us at Sugar Creek Hollow.